This article is about Maidstone town. For larger local government district, see Borough of Maidstone. For other uses, see Maidstone (disambiguation). From top left: River Medway with Maidstone's historic All Saints Church, County Hall, Leeds Castle, Mote Park, The Mall Maidstone shopping centre. Neolithic finds have revealed the earliest occupation of the area, and the Romans have left their mark in the road through the town and evidence of villas. The Normans set up a shire moot, and religious organisations established an abbey at Boxley, hospitals and a college for priests. Today's suburb of Penenden Heath was a place of execution in medieval times. Maidstone played a key role during the Peasants' Revolt of 1381. The rebel priest John Ball had been imprisoned there and was freed by Kentish rebels under the command of Wat Tyler, who is reputed to have been a resident of the town. Maidstone's charter as a town was granted in 1549; although briefly revoked, a new charter in 1551 created the town as a borough. The charter was ratified in 1619 under James I, and the coat of arms was designed, bearing a golden lion and a representation of the river (in heraldic terms: Or, a fess wavy Azure between three roundels Gules, on a chief Gules a leopard passant gardant Or). Recently to these arms were added the head of a white horse (representing Invicta, the motto of the county of Kent), a golden lion and an iguanodon. The iguanodon relates to the discovery in the 19th century of the fossilised remains of that dinosaur, now in the Natural History Museum in London. Maidstone has had the right to a town gaol since 1604. During the English Civil War, the Battle of Maidstone took place in 1648, resulting in a victory for the Parliamentarians. Andrew Broughton, who was Mayor of Maidstone in 1649 (and also Clerk to the High Court of Justice) was responsible for declaring the death sentence on Charles I, and today a plaque in Maidstone Town Centre memorialises Broughton as 'Mayor and Regicide'. Paper mills, stone quarrying, brewing and the cloth industry have all flourished here. The paper maker James Whatman and his son invented wove paper (Whatman paper) at Turkey Mill from 1740, an important development in the history of printing. A permanent military presence was established in the town with the completion of cavalry barracks in 1798. Invicta Park Barracks is now home to the 36 Engineer Regiment. Maidstone Prison is north of the town centre and was completed in 1819. Modern Maidstone incorporates a number of outlying villages and settlements (see Geography below). The county council offices to the north of the town centre were built of Portland stone between 1910 and 1913. On 29 September 1975 a local pub serving Invicta Park Barracks, The Hare and Hounds, was damaged by a bomb during an IRA campaign in England. Maidstone General Hospital opened on the outskirts of the town in 1983, replacing West Kent General Hospital, which opened 150 years earlier in Marsham Street. It is just to the north of Oakwood Hospital (originally the Kent County Asylum), which closed in the mid-1990s. Residents are employed in the retail, administrative or service sectors; there are industrial estates around the town providing employment. Some of the workforce commute to other towns, including to London. The town is divided between the constituencies of Maidstone and the Weald and Faversham and Mid Kent. Before 1997 Maidstone was in the county constituency of Maidstone. The Member of Parliament for Maidstone and the Weald is Conservative Helen Grant. Previous MPs include Ann Widdecombe, Sir John Wells, Sir Alfred Bossom and Benjamin Disraeli. Since 2015 the MP for Faversham and Mid Kent has been Conservative Helen Whately. Prior to the 2015 election, the MP was Conservative Sir Hugh Robertson. The town is the main town of Maidstone borough, which includes the surrounding rural areas except to the north-west. 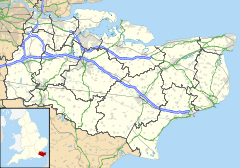 The town is divided into the 12 local government wards of Allington, Bridge, Downswood and Otham, East, Fant, Heath, High Street, Park Wood, Shepway North, Shepway South, South, and North. These wards have 30 of the 55 seats on Borough Council. In the 2011 council election, 30 of the seats were held by the Conservative party, 20 by the Liberal Democrats and 4 by independents. A former millpond on the River Len, Mill Street/Palace Avenue Maidstone. Lower Crisbrook Mill mill pond and Upper Crisbrook Mill, on the Loose Stream. The town is six miles downstream from where the River Medway, having flowed in a generally west–east direction, is joined by the Rivers Teise and Beult at Yalding and changes its course to a northerly one. It cuts through the ridge formed by the greensand, so that the town occupies a site on two opposite hills, the easterly one containing the town centre. Beyond that, and higher, is Penenden Heath. Maidstone has continued to grow. In doing so it has incorporated hitherto separate settlements, villages and hamlets within its boundaries. These include Allington, Barming, Bearsted, Penenden Heath, Sandling, Tovil and Weavering Street. Housing estates include Grove Green, Harbourland, Ringlestone, Roseacre, Shepway, Senacre and Vinters Park. Maidstone was at one time a centre of industry, brewing and paper making being among the most important. Nowadays smaller industrial units encircle the town. The site of Fremlin's Brewery, once the largest in Kent, is now Fremlin Walk shopping centre. The pedestrianised areas of the High Street and King Street run up from the river crossing at Lockmeadow; Week Street and Gabriel's Hill bisect this route. Kent experiences a maritime climate with cool summers and mild winters. The nearest official Met Office weather station for which online records are available is at East Malling, about three miles west of Maidstone. East Malling's highest temperature of 37.4 °C (99.3 °F) was recorded in August 2003. The lowest temperature recorded is −17.8 °C (0.0 °F) during January 1947 and 1972. East Malling also holds the record for the mildest January day in South East England, 17.4 °C (63.3 °F), also set in 2003. The lowest temperature recorded in recent years was −10.7 °C (12.7 °F) on 20 December 2010. The Köppen Climate Classification subtype for this climate is "Cfb" (Marine West Coast Climate). In the 2001 UK census, Maidstone town wards had a population of 75,070, a density of 28 residents per hectare. The town had 31,142 households, of which 38% were married couples, 29% were individuals, 10% were cohabiting couples, and 9% were single-parent families. 14% of households had someone living alone of pensionable age. The ethnicity was 96.6% white, 0.9% mixed race, 0.3% Chinese, 1.5% other Asian, 0.4% Black and 0.3% other. The place of birth was 94.1% United Kingdom (91.4% England), 0.6% Republic of Ireland, 0.6% Germany, 1.3% other European countries, 1.7% Asia, 0.9% Africa and 0.8% elsewhere. Religion was 73.9% Christian, 0.8% Muslim, 0.7% Hindu, 0.3% Buddhist, 0.14% Sikh and 0.11% Jewish. 15.8% had no religion, 0.6% had an alternative religion, and 7.7% did not state their religion. Until 1998, the Sharps toffee factory (later part of Cadbury Trebor Basset), was in central Maidstone and provided a significant source of employment. Loudspeaker manufacturer KEF was founded in 1961 on the premises of the metal-working operation Kent Engineering & Foundry (hence KEF). KEF still occupies the same river-bank site. In the late 1990s KEF manufactured a loudspeaker called "the Maidstone". The town centre has the largest office centre in the county and the area is a base for the paper and packaging industry. Many high-technology firms have set up in surrounding business parks. Southern Water and Mid Kent Water operate the Maidstone water system. The town is ranked in the top five shopping centres in the south east of England for shopping yields and, with more than one million square feet of retail floor space, in the top 50 in the UK. 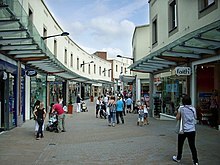 Much of this space is located in the two main shopping centres in the town, the 535,000 square feet (49,700 m2) The Mall Maidstone and the 32,500 square metres (350,000 sq ft) Fremlin Walk which opened in 2006. Other recent developments include the riverside Lockmeadow Centre, with a multiplex cinema, restaurants, nightclubs, and the town's market square. The leisure industry is a key contributor with the night-time economy worth £75m per annum. In the 2001 UK census, 45.2% of residents aged 16–74 were employed full-time, 12.7% part-time, 7.6% self-employed and 2.5% unemployed, while 2.3% were students with jobs, 3.0% without jobs, 12.9% retired, 6.6% looking after home or family, 3.8% permanently sick or disabled and 3.2% economically inactive for other reasons. These figures were roughly in line with the national average. Employment, by industry, was 19% retail; 13% real estate; 11% manufacturing; 9% construction; 7% transport and communications; 10% health and social work; 8% public administration; 7% education; 5% finance; 4% hotels and restaurants; 1% agriculture; 1% energy and water supply; and 5% other. Compared to national figures, Maidstone had a high percentage of workers in construction and public administration, and a low percentage in agriculture. According to the Office for National Statistics estimates, the average gross income of households between April 2001 and March 2002 was £595 per week (£31,000 per year). Residential developments along the river upstream of the Palace. One of the first roads in Kent to be turnpiked was from Rochester to Maidstone, in 1728. The A20 runs through the town and the M20 motorway runs to the north. Opened in 1960 as the Maidstone Bypass A20(M), this was the first motorway south of London. Maidstone is a hub for major roads: the M20 motorway, the A229, A249, A20 and A26. The M2 motorway is a short distance to the north and the A21 also runs close to the town. The historic centre of the town is largely pedestrianised or with restricted access for private vehicles, which are diverted around a one way system. The River Medway was, until the coming of better roads and the railways, the principal means of transporting goods. Improvements had been made in about 1730 to the river so that barges of 40 tons could get upriver to East Farleigh, Yalding and Tonbridge. This meant that a good deal of trade, including corn, hops, fodder, fruit, stone and timber passed through the town, where there were several wharves. The medieval stone bridge was replaced in 1879 to give better clearance: it was designed by Sir Joseph Bazalgette. A second bridge, St Peter's Bridge, was built in 1977. Today the river is of importance mainly to pleasure-boat owners and the considerable number of people living on houseboats. For many years there has been a river festival during the last weekend in July, and a millennium project inaugurated the Medway River Walk, the Medway Park and a new footbridge linking the former cattle market (now a multiplex cinema and nightclub) west of the river to the shopping area to the east. Bus services centre on High Street, King Street and the Chequers Bus Station adjacent to the Mall shopping centre and serve nearby towns including Chatham, Faversham, Sittingbourne, Tonbridge, Royal Tunbridge Wells, Ashford and Tenterden. Most services are operated by Arriva and some operated by Nu-Venture. Stagecoach also operates route 10X in the town to Ashford via Lenham, with most buses continuing onto Hythe and Folkestone. There are weekday commuter coach services between Maidstone and London. Former bus operators in Maidstone include Maidstone & District Motor Services (M&D); Maidstone Borough Council Transport, later Boro'line Maidstone; and Bygone Buses. 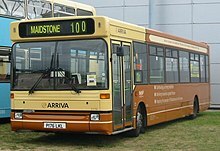 In 2004 the centenary of Maidstone Corporation Transport was marked with several events, featuring a preserved Maidstone trolleybus. When the railways were built in the 1840s, Maidstone was not well served. It was reported at the time that inhabitants were bitterly opposed to the railway, the mayor suggesting that "Maidstone will be ruined as a commercial town". It was said that wharfingers and corn and coal merchants would be hardest hit. In 1842, the South Eastern Railway, to reach the Channel ports of Folkestone and Dover, put its main line through Tonbridge and Ashford, some 6 miles (9.7 km) to the south. A station named Maidstone Road was built in an isolated spot called Paddock Wood, from where coaches were run to the county town. The 1874 Maidstone East line crossing the River Medway; also on the bridge is a footpath connecting Maidstone East with Maidstone Barracks. Two years later a branch line was built to Maidstone. In 1846 the Medway Valley Line connected Strood with the town. It was not until 1874 that the line from London arrived, and another ten years before Ashford was connected by rail. There are three stations: Maidstone West and Maidstone Barracks on the Medway Valley Line (whose platforms are visible one from the other); and Maidstone East on the Ashford line. In 1905, the Headcorn & Maidstone Junction Light Railway was authorised under the 1896 Light Railways Act to link Maidstone with Sutton Valence and Headcorn, linking with the Kent & East Sussex Railway. The only part built was a short branch serving the paper mills at Tovil. The Medway Valley Walk between Tonbridge and Gillingham passes through the town, following the banks of the river. Between 1928 and 1967, Maidstone had a small trolleybus network. The system had two main routes from the High Street, one along Tonbridge Road to a terminus near the Bull Inn at Barming and the other along Loose Road and Sutton Road to Park Wood, with a spur along to Loose village. The town is served by 15 secondary schools, 23 primary schools, and two special schools. Non-selective secondary schools include Cornwallis Academy, Maplesden Noakes, New Line Learning Academy, St Augustine Academy, St. Simon Stock School and Valley Park School. Grammar schools serving the town include Maidstone Grammar School, Invicta Grammar School, Maidstone Grammar School for Girls and Oakwood Park Grammar School. 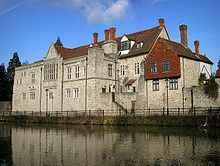 Alumni of the oldest school, Maidstone Grammar School (founded 1549), include James Burke, television presenter, and Lord Beeching, of the British railway cuts of the 1960s. William Golding, author of Lord of the Flies was once a teacher at the school. Oakwood Park to the west of the town is host to a regional campus of the University for the Creative Arts (formerly Kent Institute of Art & Design) at which Turner Prize nominated artist Tracey Emin, fashion designer Karen Millen and television personality and artist Tony Hart studied. In the 2001 census, 15.7% of residents aged 16–74 had a higher education qualification or equivalent, below the national average of 19.9%. 27.5% had no academic qualifications, compared to the national figure of 28.9%. In 2001, religions were 73.9% Christian, 0.8% Muslim, 0.7% Hindu, 0.3% Buddhist, 0.14% Sikh and 0.11% Jewish. 15.8% had no religion, 0.6% had an alternative religion, while 7.7% did not state their religion. All Saints' Church in the town centre was the collegiate church of the College of All Saints built in 1395 next to the Archbishop's Palace. It is a landmark building[clarification needed] and is one of the largest and widest parish churches in England. It contains a monument to Sir Jacob Astley, the Royalist Civil War soldier and a memorial to Lawrence Washington, great-uncle of George Washington's great-great-grandfather, that includes the stars and stripes in the family coat of arms  The college, the church, the palace and the palace's tithe barn are all Grade I listed buildings. A Twinning Association Committee meets every month. It organises annual trips to the Jeanne Hachette Festival in Beauvais. An annual sporting weekend is also held, with Maidstone and Beauvais taking it in turns to host the event. There are several radio stations based in the town, or which broadcast to it. KMFM Maidstone, formerly CTR 105.6, is the local commercial station. It used to broadcast from studios on mill street, however now broadcasts from the studios of sister station KMFM Medway in Strood. Hospital Radio Maidstone, which broadcasts from Maidstone Hospital, is one of the longest serving hospital radio stations in the UK. A new version of former pirate radio station Radio Caroline broadcasts (via Sky and the internet) from The Maidstone Studios, an independent television studio complex in the Vinters Park area, once home to the former ITV company TVS. Several national TV shows are also filmed at the studios. Heart Kent used to broadcast from studios in Earl Street. Theatres include the Hazlitt Theatre; RiverStage; The Exchange Studio (previously the ‘‘Corn Exchange’’); and the Hermitage Millennium Amphitheatre. Maidstone is mentioned several times in Ian Fleming's 1955 James Bond novel, Moonraker. Villain Hugo Drax passes through King Street and Gabriels Hill and later stops at the Thomas Wyatt Hotel. Writer Jack London recounts his visit to Maidstone in his 1903 book The People of the Abyss. Whilst living in the slums of London in the summer of 1902, he heads to Maidstone in search of hop-picking work up the London Road. He finds lodgings with a "Sea Wife" living in the poor quarter of Maidstone, and persuades her and her husband to let him stay in their front room. 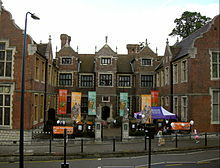 Maidstone Museum & Art Gallery is located in the town centre, near to the Fremlin Walk shopping centre. Operated by Maidstone Borough Council, the museum is open seven days a week, with free admission. The Museum & Art Gallery has a large collection of over 600,000 objects, including collections about ancient Egyptians; archaeology; costume; ethnography; biology; fine and decorative art; geology; Japanese decorative arts and prints; and local history. It also hosts temporary exhibitions. The core of the museum is located within the former Chillington Manor, an Elizabethan manor house completed in 1577. New wings were added to the building in the 19th century. A striking gold-coloured extension was added in 2012 which has extended the display space by 40% but the modern design has divided opinion. Kent Life, formerly the Museum of Kent Life, is an open air rural life museum at Sandling, near Allington Locks, on the east bank of the River Medway. The museum includes a collection of historic buildings including a chapel, village hall and old houses. It also includes displays on agriculture, including a farm yard and farm animals. The Tyrwhitt-Drake Museum of Carriages is located in a Grade I Listed tithe barn near the Archbishop's Palace. The museum was established by Sir Garrard Tyrwhitt-Drake, a former mayor of Maidstone, who amassed a large collection of horse-drawn vehicles. Following the NASA tradition of naming craters on Mars after small towns, the Maidstone crater was added to the list of Martian geographical features in 1976. Maidstone United was formed in 1897. 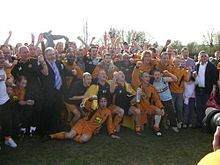 The club gained promotion to the Football League in 1989, from non-league football. The club could not bring its London Road Ground up to Football League standards so it ground-shared at Dartford's Watling Street stadium and played its games there. It went bankrupt in 1992. A new club was formed and made its way from the Kent County League Division 4 to the Isthmian (Ryman) Premier Division, in 2014 being in the Ryman Premier Division. The club moved into the new Gallagher Stadium at James Whatman Way in summer 2012. Since then, it has been promoted to the National League South and now plays in the National League, bringing fifth-tier football back to the club for the first time since 1989. Maidstone Hockey Club is one of the oldest hockey clubs in the country, founded in 1878. For the 2011/12 season, the Ladies' 1st XI play in the National League East Conference, having won the East Premier League the previous season, and the Men's 1st XI play in the South Hockey League 1st XI Premier League Division 2. The Men's and Women's 1st squad were both represented in the Indoor England Hockey League Division 2, with the Men having previously won the Division 2 title in 2008/09. The club has seven men's and four women's sides playing in national, regional and county leagues. Maidstone Rugby Football Club is one of the older rugby clubs in England having been founded in 1880. The club runs 6 senior men's sides and a junior section. In the 2014/15 season they were unbeaten and won the National RFU Intermediate Cup at Twickenham Stadium. Kent County Cricket Club used Mote Park as a regular out-ground for some 150 years until 2005. Mote Park is the town's largest park and includes a number of recreational and sport facilities. The Lashings World XI exhibition cricket team is based in Maidstone and has included a number of high-profile professional cricketers. Maidstone Sailing Club sails on Mote Park lake. Maidstone also has a rowing club, a martial arts school, a tennis club, an athletics club, an American football team and a basketball club. A baseball team, the Kent Mariners, is based in the town, playing in the BBF AA South division. Angela Barnes (born 1976), actress and comedian, grew up in Maidstone. ^ "Grid Reference Finder". gridreferencefinder.com. ^ "2011 Census - Built-up areas". NOMIS. June 2013. Retrieved 7 September 2017. ^ "Origin of place name". Hereshistorykent.org.uk. Archived from the original on 20 July 2011. Retrieved 5 August 2011. ^ "UK | England | Kent | Dig uncovers a Roman bath house". BBC News. 3 June 2004. Retrieved 2 September 2012. ^ Roberts, Matt T.; Etherington, Don. "Whatman, James (1741-1798)". Bookbinding and the conservation of books; A dictionary of descriptive terminology. U.S. Government Printing Office. ISBN 0844403660. ^ "Parliamentary accounts and papers". UK Parliament. 23 July 1847. Retrieved 9 December 2015. ^ "A History of 36 Engineer Regiment" (PDF). Archived from the original (PDF) on 7 April 2014. Retrieved 6 April 2014. ^ "Widdecombe to stand down as MP". London: Guardian.co.uk. 8 October 2007. Archived from the original on 15 October 2007. Retrieved 23 November 2007. ^ "Kent County Councillors. Retrieved 30 April 2012". Democracy.kent.gov.uk. Retrieved 2 September 2012. ^ "Election Maps". Ordnance Survey. Archived from the original on 13 November 2007. Retrieved 23 November 2007. ^ "Maidstone Borough Council". Maidstone Borough Council. Retrieved 29 March 2007. ^ "Locateinmaidstone.com". Locateinmaidstone.com. 23 May 2011. Retrieved 5 August 2011. ^ "Ten Fascinating Historical Facts About Maidstone". Kent Online. 18 March 2016. Retrieved 2 April 2017. ^ "2003 Heatwave". Met Office. Archived from the original on 28 February 2011. ^ "2003 January". Met Office. ^ "2010 December". Met Office. ^ "Travel Weather Averages (Weatherbase)". Weatherbase. Retrieved 28 September 2015. ^ "East Malling 1961-90 averages". Met Office. Archived from the original on 10 February 2001. Retrieved 16 September 2011. ^ a b c d e f g "Neighbourhood Statistics". Statistics.gov.uk. Archived from the original on 25 May 2011. Retrieved 23 November 2007. ^ "Kent Schools - Search". webapps.kent.gov.uk. Retrieved 21 October 2017. ^ "Jubilee Church Maidstone". TotalGiving. Retrieved 3 August 2018. ^ "Masada Jubilee Church". Jubilee church. Retrieved 3 August 2018. ^ "Town Twinning (Beauvais)". Maidstone Borough Council. Retrieved 11 August 2014. ^ Fleming, Ian (1965). Moonraker. Pan. p. 131. ^ London, Jack (1963). The People of the Abyss. Panther. p. 75. ^ "Collections". Maidstone Museum. Retrieved 11 August 2014. ^ "Maidstone Museum's new £3.7m extension officially opens". BBC News. 31 March 2014. Retrieved 11 August 2014. ^ "Mars crater named after Tooting". BBC News. 11 January 1998. Retrieved 28 November 2010. ^ "IAU Gazetteer of Planetary Nomenclature". ^ "EML Latest results&tables NE". East-hockey2.co.uk. Retrieved 5 August 2011. ^ "Premier - Division 1". South-league.com. 16 April 2011. Retrieved 5 August 2011. ^ "Englandhockey.co.uk". Englandhockey.co.uk. Retrieved 5 August 2011. ^ "Englandhockey.co.uk". Englandhockey.co.uk. 22 January 2009. Retrieved 5 August 2011. ^ "Maidstone Rugby Club". Maidstonerugby.org.uk. Retrieved 5 August 2011. ^ "Magnificent Maidstone cap perfect season with Intermediate Cup victory". England Rugby. Retrieved 10 March 2018. ^ "Lashings CC relinked 15 December 2011". Retrieved 10 March 2018. ^ "Charlton Athletic: Joe Pigott signs new contract". BBC Sport. BBC. 3 September 2013. Retrieved 12 February 2018. Wikimedia Commons has media related to Maidstone. 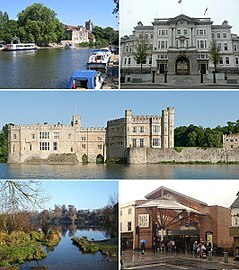 Wikivoyage has a travel guide for Maidstone.